New Birmingham based Foundation aims to inspire youngsters, near and far. 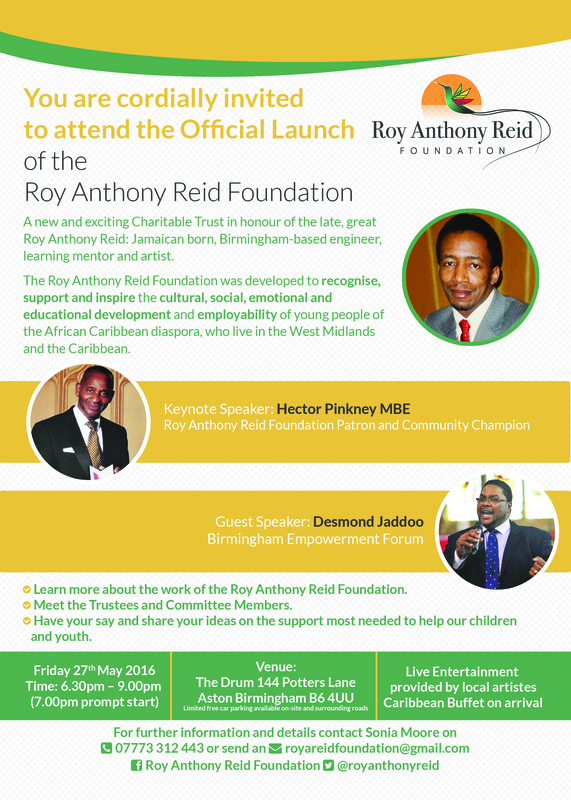 The Roy Anthony Reid Foundation, a recently established charitable trust with a mission to help recognise, support and inspire the aspirations of young people of the African Caribbean diaspora, from Birmingham to the Caribbean, will be holding its official launch on Friday 27th May 2016, 6.30pm, at The Drum, in Aston, Birmingham. Developed as a legacy in memory of the late Roy Reid, a former Inclusion manager and learning mentor to newly arrived students at Harborne Hill, Four Dwellings and Mosely Schools in Birmingham, and passionate lover of the arts including photography, the Foundation aims to bridge the current gap in youth support and provision by creating and delivering a programme of specialist activities centred on raising aspirations, addressing current educational and societal needs and helping those not in education, employment and training to improve their employment prospects. Sonia Moore, Founder, and sister of the late Mr Reid stated, “The sudden and unexpected passing of my brother left a huge void in my life and that of his wider family. We had always been inseparable from our humble beginnings in Jamaica, West Indies, to the many years we spent in England, living only five minutes apart. 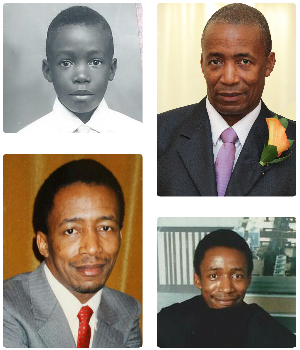 Mr Reid was a dedicated and committed individual and did much in supporting a number of young people from the African Caribbean diaspora. My family and close friends saw it befitting that we honour his legacy and proud identity as a Jamaican, by setting up a Foundation to support the very same causes he lived for within the West Midlands and Caribbean. I am delighted by the positive response we have received from everyone in relation to the Foundation, and we will be joined on the evening by, Mr Hector Pinkney MBE, ‘Mr Handsworth’, who accepted my invitation to act as Foundation Patron. Minister Desmond Jaddoo, founder of the Birmingham Empowerment Forum will also be in attendance as guest speaker. Reverend Eve Pitts and many other local Birmingham-based community champions have also pledged their support to this much needed initiative. 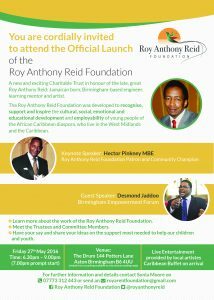 The launch event is free to attend and will provide an opportunity to learn more about the proposed work of the Foundation and the chance to contribute ideas on areas requiring urgent action to help transform the fortunes of young people throughout the West Midlands and Caribbean. Guests will also meet the Foundation’s Trustees and Committee Members who all share a similar passion for making a difference. Entertainment will also be provided by local artistes and groups to ensure a vibrant and lively evening will be experienced by all.